There are different features that you should consider when you are checking out a vehicle and the safety features of a vehicle are something that should not be overlooked. The popular luxury SUV that is the Volvo XC90 is set up with safety features to protect you and your passengers. 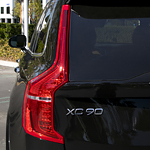 There is a special feature with the Volvo XC90 that can help you out if you are involved in a collision. This standard feature works with your brakes when you are involved in a crash. The automatic braking after collision that this vehicle offers can keep your vehicle from being damaged and keep you and your passengers from being injured. The structure of the Volvo XC90 is strong and this can help you out if you are involved in a crash. The sides of this vehicle look out for you when you are hit and they help you stay safe.